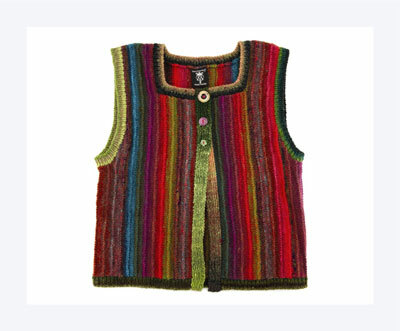 Knitting a vertically stripped vest relies on long-repeat self-striping yarn for its color changes. 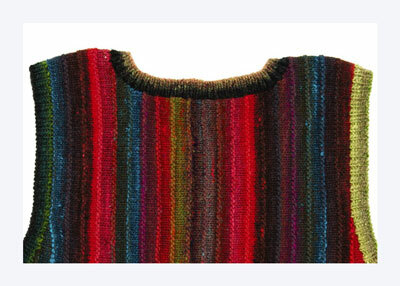 Knitting the piece from side to side causes the stripes to run vertically, for a slimming effect on the body. 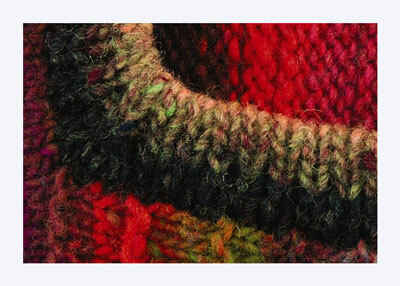 The texture of the purl ridges in the simple stitch pattern repeats the vertical element. With MC, CO 78 (80, 82, 84) sts. Work even in charted patt until piece measures 3-1⁄2 (4, 4-1⁄2, 5)” from CO, ending with a RS row. CO 24 sts at beg of next WS row. 102 (104, 106, 108) sts. Work even in patt until piece measures 6-1⁄2 (7, 7-1⁄2, 8)” from CO, ending with a RS row. 3 sts at beg of next 5 WS rows — 47 (49, 51, 53) sts. Work even in patt until piece measures 9-3⁄4 (10-3⁄4, 11-3⁄4, 12-3⁄4)” from CO, ending with a RS row. CO 3 sts at beg of next 5 WS rows. CO 40 sts at beg of foll WS row — 102 (104, 106, 108) sts. Work even in patt until piece measures 14 (15, 16, 17)” from CO, ending with a RS row. BO 5 sts at beg of next WS row. BO 3 sts at beg of foll WS row. BO 1 st at beg of next 3 WS rows — 91 (93, 95, 97) sts. Work even in patt until piece measures 23 (24, 25, 26)” from CO, ending with a RS row. Inc 1 st at beg of next 3 WS rows. CO 3 sts at beg of foll WS row. CO 5 sts at beg of next WS row — 102 (104, 106, 108) sts. Work even in patt until piece measures 27 (28, 29, 30)” from CO, ending with a RS row. BO 40 sts at beg of next WS row. BO 3 sts at beg of foll 5 WS rows — 47 (49, 51, 53) sts. Work even in patt until piece measures 30-1⁄4 (31-3⁄4, 33-1⁄4, 34-3⁄4)” from CO, ending with a RS row. Work even in patt until piece measures 34-1⁄2 (36, 37-1⁄2, 39)” from CO, ending with a RS row. BO 24 sts at beg of next WS row — 78 (80, 82, 84) sts. Work even in patt until piece measures 38 (40, 42, 44)” from CO. BO. 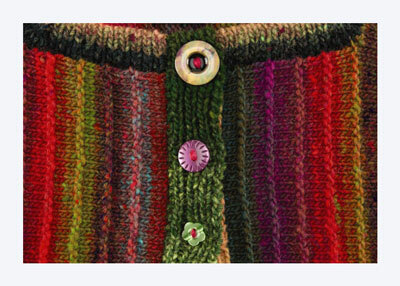 Working from RS, with CC, pick up and knit 204 (214, 226, 236) sts along lower edge of vest. Work in k1, p1 rib for 1″. BO. Block vest. Sew shoulder seams with MC and a tapestry needle. Working from RS, with CC and 16″ circular needle, pick up and knit 122 (124, 126, 128) sts around left armhole, beg and ending at center of underarm. PM, join rnd, and work in k1, p1 rib for 1″. BO. 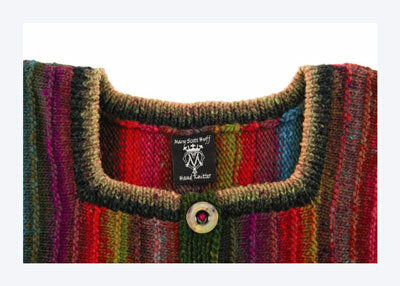 Working from RS, with CC and 24″ circular needle, pick up and knit 21 (24, 27, 30) sts along left front neckline. PM in 21st (24th, 27th, 30th) st. 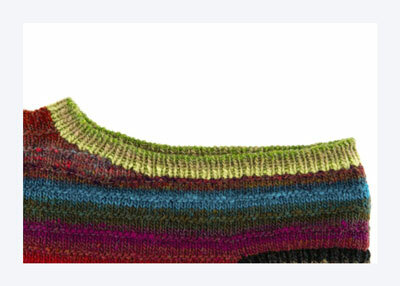 Pick up and knit 115 sts along left side neckline, back neckline, and right side neckline. Pick up and knit 1 st along right front neckline and PM in this st, then pick up and knit 20 (23, 26, 29) sts along right front neckline. Work in k1, p1 rib for 1″, dec 1 st at each side of each marked st on every RS row to form mitered corners. BO. Left band: With CC, CO 8 sts. Work in k1, p1 rib until piece, when slightly stretched, reaches from lower edge to top of left front edge (approx 17 [17-1⁄2, 18, 18-1⁄4]”). BO. Sew band in place with CC and tapestry needle. Right band: With CC, CO 8 sts. Work in k1, p1 rib until piece measures 12-1⁄2 (13, 13-1⁄2, 13-3⁄4)” from CO, ending with a WS row. Buttonhole row (RS): Work 4 sts, MB, work to end. Work even in rib until piece measures 14-1⁄2 (15, 15-1⁄2, 15-3⁄4)” from CO, ending with a WS row. Work buttonhole row. Work even in rib until piece measures 16-1⁄2 (17, 17-1⁄2, 17-3⁄4)” from CO, ending with a WS row. Work buttonhole row. Work even in rib until piece measures 17 (17-1⁄2, 18, 18-1⁄4)” from CO, ending with a WS row. BO. Sew band in place with CC and tapestry needle. Sew buttons in place on left band, under buttonholes. Steam bands to block.